Just last summer, there were rumblings that Disney Animation would be making their first foray into Marvel territory with an adaptation of the lesser known comic book Big Hero 6. The series followed a team of state-sanctioned superheroes at the disposal of the Japanese government with a top-secret consortium of politicians and business entities known as the Giri formed to recruit and train potential superhuman operatives. 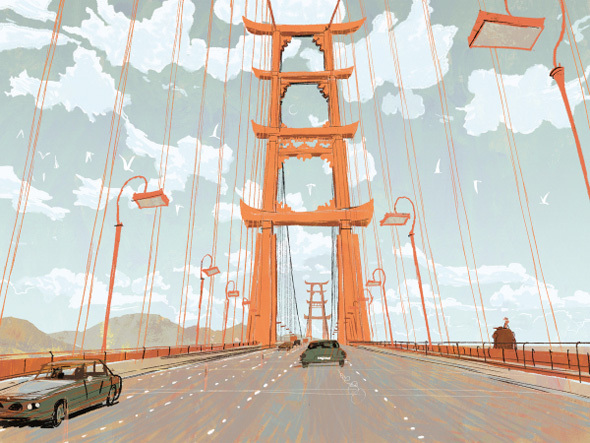 Now Disney has announced the film with a 3D release on November 7th, 2014 along with concept art, and a gorgeous first look at the setting: the mythical mash-up city San Fransokyo. Don Hall (Winnie the Pooh) is directing the film which focuses on brilliant robotics prodigy Hiro Hamada, who finds himself in the grips of a criminal plot that threatens to destroy the fast-paced, high-tech city of San Fransokyo. With the help of his closest companion—a robot named Baymax—Hiro joins forces with a reluctant team of first-time crime fighters on a mission to save their city. Hero Complex points out that, "Characters in the original comic include a samurai, an agent who invented a nanotechnology-based Power Purse and a monster born from a child’s drawings." But we're not sure just who will make it into this feature film adaptation of the comic series originally created by Steven T. Seagle and Duncan Rouleau in 1998. And Hall was very much interested in doing something that was both Marvel and Disney at the same time. And when it came to the world in which the film was created, Hall says, "Marvel properties take place in the real world. We were looking for something to do where we could make our own world — bring in the Japanese influences, have recognizable landmarks mashed up with a Japanese aesthetic.” Obviously, being unfamiliar with the comic, I'm not sure of what to expect, but just the setting looks very cool. Disney has a lot to live up to after the success of Pixar's The Incredibles, but this seems like something much different, especially with Marvel comics as the source material. We'll be keeping an eye on this one. Sound good? Oh this sounds rather good. Really liked that, be good to see the scene with people in. Soo...how exactly does including 'Silver Samurai' work? He's an X-Men character and is going to be in The Wolverine, correct? animated, won't be in cinemas, so fox (is it fox i can't remember), don't have any rights in this regards. And generally speaking its good to think of animated properties as separate from their other counterparts. This has a theatrical release date...although from what I understand the rights to use the characters in animated properties are definitely different. Plenty of Marvel animated shows and films include any and all cross-pollination that they want. Also, I'm assuming that this won't be part of the MCU...as this looks a bit more on the outlandish cartoony side.